Move right in to this rare 3-bedroom townhouse in Consolidated Co-operatives of Scottsdale East! All new cabinets and counters in kitchen and bath, new flooring, freshly painted and ready for you to enjoy this sought-after Co-op with seven pools, sport court, community picnic and play areas! Owner-occupied and CASH ONLY - NO RENTALS - Buyer is purchasing membership in co-operative community, so no deed no title insurance or escrow. Board and and court approval required - see application and other info in documents. 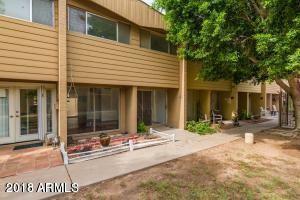 Great location - Minutes to Old Town, ASU, excellent shopping and dining, and freeways to all over The Valley!